Back in the 80’s and 90’s, the only kind of restaurants we went out to as kids were the ones that served good North Indian cuisine. A good ambiance and décor was just one factor. A commendable restaurant however, was measured by the North Indian fare it served on its menu. A simple, hot Dal Tadka that had a great smoky flavor; the rich Palak Paneer in its deepest green hues - deeper the green, better the dish - that meant, it was stir fried better, hence it tasted better; Baingan ka Bharta dotted with cooked fresh peas and shreds of ginger juliennes, topped with fresh cream or melting butter, Choles and Rajamas that were spiced liberally and had a good layer of fat floating atop, the ladle going deep to stir it up gently before being served by the waiter; all of this usually formed an integral part of an Indian restaurant menu. This was either served with an assortment of Indian flatbreads like naans and kulchas or flavored rice like Biryanis and Pulaos. No Indian restaurant menu though was complete without the quintessential assortment of gravies made from either the fragrant butter and cream based tomato sauce, or the white cream and nut sauce. Dal Makhani, Paneer Makhani, Malai Kofta, Veg Makhani, Paneer Butter Masala, Phool Makhani, Navratna Korma, Shahi Paneer and such alike formed the elite part of the menu. They weren’t the usual dishes most moms would cook at homes, hence relishing them at restaurants was a treat we looked forward to. 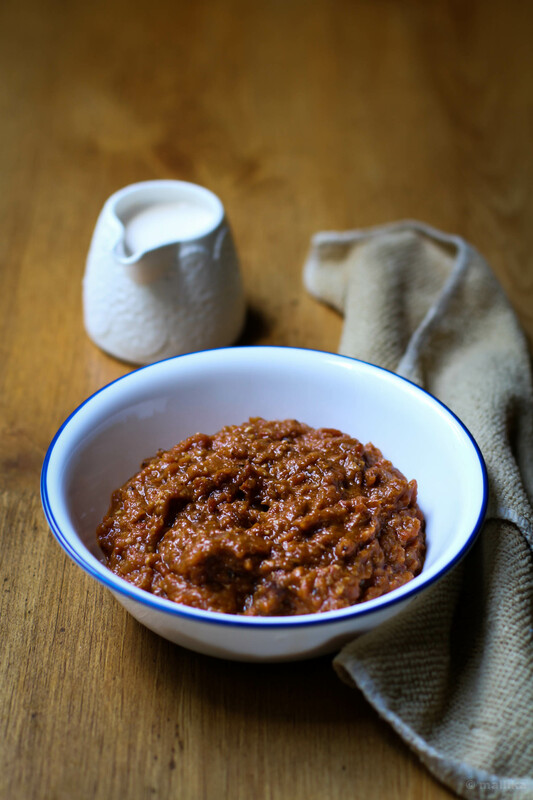 I loosely remember how our palms smelt of makhani masalas after several hours of being back home from savoring the heavy North Indian meal at those restaurants. Though, that was a thing of past. We no longer gauge a restaurant by the standards of Indian food served. There are plenty of global cuisines to explore from, so usually an Indian fare takes the least preference. We love settling to home cooked Indian meals most of the times, replicating restaurant styled dishes at home in the comfort of my kitchen. On a Valentine's Day, when the restaurants are brimming with crowd, here's a better way to cozy up your evening - with good home cooked food and music to make your day memorable with your loved ones. I have a fantastic recipe for Paneer Makhani for you. It's a keeper for years to come and you may want to thank me for that. The heart of a good Paneer Makhani dish lies in its base, the rich and flavorsome tomato cream sauce that can be made ahead and stored for a couple of weeks in the freezer. Inspired by Soma's post here, I have loosely adapted her recipe for Makhani Masala, tweaked it a bit to get a beautiful recipe that makes an array of dishes with just one basic gravy. This is where you start and can further adapt it to make many more popular recipes that are usually found in Indian restaurants. So this Valentine's Day, if you are running out of place to dine out or if you've made no fancy plans to spend the evening as you had wished to, whip up this restaurant styled recipe in your kitchen, lay your table, light your candles and surprise them with this dish in the warmth of your own home. And don't forget to tell them how much you love them. 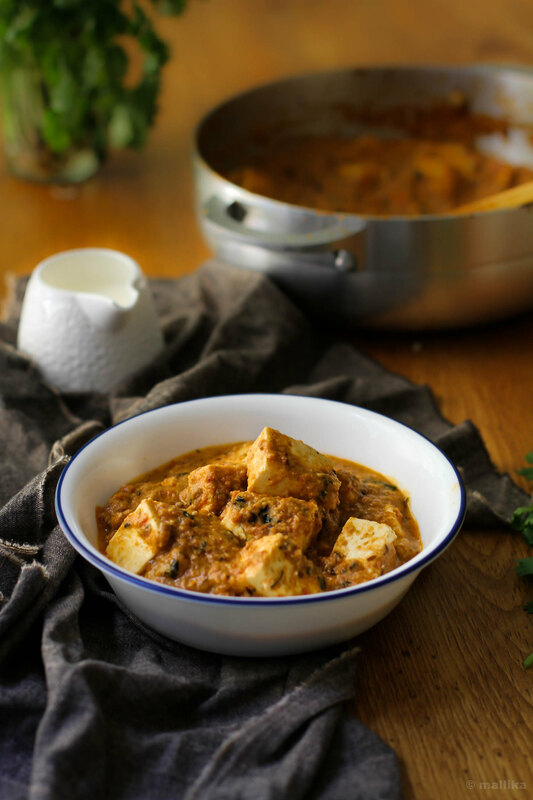 Ofcourse, if you don't, this Paneer Makhani will do that for you! Heat the butter / ghee / oil & add the green cardamoms, cinnamon stick. Fry for 20 seconds. Add the fenugreek powder / seeds and fry for another 10 seconds. Never let the fenugreek burn, else they will turn the dish bitter. Add the grated ginger, the garlic paste and fry them till the raw smell is gone. Next add the tomato paste and cook till it reduces and oil bubbles up from the sides of the pan. Add the red chilli powder, slit green chilli, garam masala, and salt to taste. Finally crush kasuri methi gently between palms and add it to the simmering gravy. At this point you can either turn off the flame, allow the gravy to cool and store the prepared Makhani Masala in air tight container and freeze it for future, or proceed ahead to prepare the Restaurant Styled Paneer Makhani. 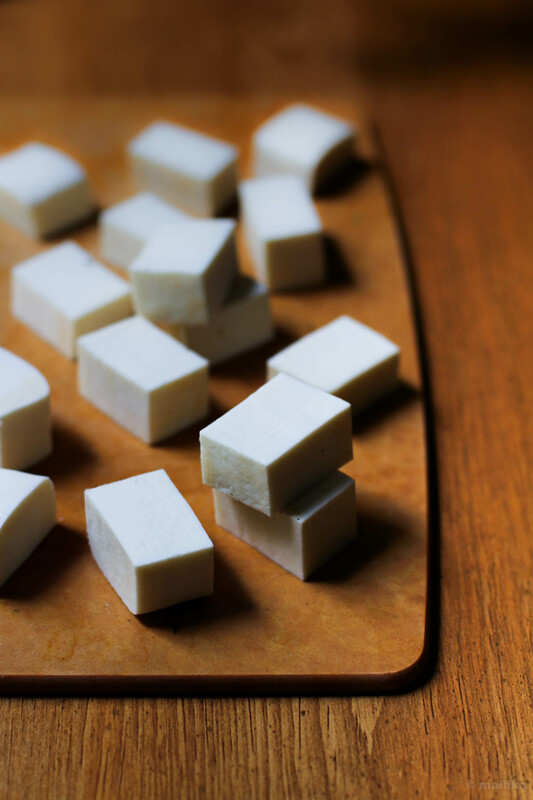 To the above simmering gravy, add 1/2 cup of water and cubed paneer and bring it to a boil. Stir and cook for 3 minutes. Finally add the cream and simmer for 2 minutes. 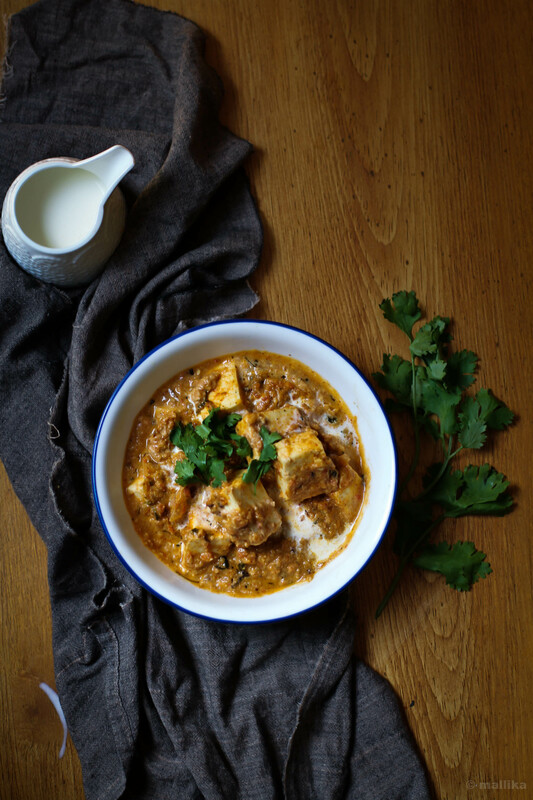 Transfer the Paneer Makhani to a serving bowl and garnish with cream, ginger juliannes and coriander leaves. Serve hot with rotis, naans or kulchas. Pairs well with Jeera rice too. - The above quantity of Makhani Masala will suffice for this Paneer Makhani recipe. Should you make in larger quantities, you can easily double up the recipe and store them in the freezer. - This is a rich dish and is supposed to be made with butter or ghee. If you want it to be healthier use oil instead of butter or ghee. However, you are compromising on the taste. - The color of the gravy depends on the amount of cream and the red chilli powder being used. If you want a richer red color, use Kashmiri chilli powder. More the cream, lighter the color. - Kasuri methi leaves are dry fenugreek greens. Its a MUST in this recipe and renders a lovely flavor. However, don't use a lot of it. It can be overpowering. - In case you plan to make ahead and store the makhani gravy, then I recommend you use half a tsp. of the kasuri methi greens to the gravy. The other half tsp. can be added as you prepare the final dish. This will enhance the flavor of dish and fresh crushed green render amazing flavor to the dish. - There are no onions used in this recipe. You can avoid the garlic for a satvik version. However do not skip ginger as it gives a lot of flavor to this dish. Glad to hear this Riya! Really nice and delicious looking recipe. It looks like the one ordered from hotel. 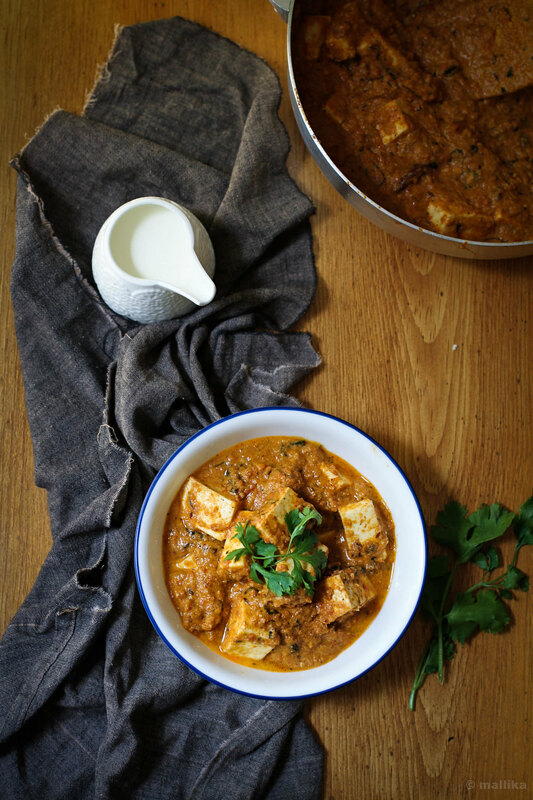 Those Paneer chunks looks super tempting and the whole dish itself too. Great job.